A Feast for the All the Senses! Ahhh Italy… rich history, legendary cuisine and unimaginable beauty wherever you gaze. It’s where Julius Caesar ruled, Michelangelo painted and the Pope blesses the masses from his haven in Vatican City. No one comes back from Italy unchanged – and for good reason. This is the photo tour you’ll be talking about for years to come. From the crowded, cobblestone streets of Rome, to the slow, winding roads of the Tuscan Hills, we’ll immerse you in the abundant culture Italy has to offer. Together, we’ll explore historic ruins in the capital city, sip wine from Chianti vineyards and gaze upon priceless frescos painted for kings. Starting in Rome, we’ll journey east to the Italian Riviera on the Mediterranean Sea, with stops in Florence, San Quirico, Pienza, Viterbo and more along the way. You’ll soon find that, in Italy, there’s magic around every corner. Oh, and we almost forgot… we’ll take some extraordinary pictures, too. Lots of them. Our pro-­photographer tour leaders have years of experience capturing Italian subjects; the Colosseum, Roman Forum, and the Pantheon. Of course, these are expected. But sunrise over the Val D’Orcia countryside, with its early morning fog and quintessential hillside farmhouse lined with Cypress Trees? We’ve got that shot, too. And many other off­-the-­beaten-­path spots as well. We only take 8 people on this life-changing tour. Read the details below and reserve your place in our group. Our Visions of Italy tour is an all­ encompassing cultural phenomenon. It’s got food, wine, history, art, and architecture. This tour pulls you in and doesn’t let go. Let’s start with the food: this isn’t a spaghetti and meatballs kind of tour. This is a feast of authentic, age­-old dishes pouring from the kitchen like a never-ending freight train of epicurean goodness. Then there’s the wine. It’s Italian Vino (what more is there to say? ), and it flows like the River Arno through the heart of Florence. Did you know the Vatican Museum has over nine miles of paintings? Well, it does ­­and our VIP tour skips the lines and puts you right in front of its must­-see Renaissance Masterpieces. We suggest checking out the inclusions section on this page to get a sense of just how much awesomeness we packed into our Italy tour. We’re going to take a moment and pat ourselves on the back for this one. There are so many wonderful shots to get in Italy, and we’ve taken all the guesswork out about where to capture the magic. We know these locations like Michelangelo knows the Sistine Chapel. When planning shots, we consider weather, traffic, crowds, time of day, construction and more. We know exactly where to be and the precise time to be there, all to make sure you get that shot your friends and family will envy. At the end of the day, taking unbelievable pictures is what we do, and now we’re sharing these locations with you. Our photographers are the heart of our company… and they’re so much more than their incredible talent. Sure, they’ve traveled the world and captured beauty beyond our wildest dreams. Sure, they’ve graced the covers of magazines and websites and earned the respect of their industry. But it takes much more to be a Discovery Photo Tour Leader. Simply put, our photographers are good people. You’ll travel, explore and learn with them, you’ll share meals together, and they’ll show you how to capture amazing pictures. And at the end of the tour, you’ll have a lifelong friend; the newest addition to your holiday card list. Our tour leaders are here to make your journey unforgettable, and that’s why they’re not only world ­renowned for their craft, but they’re also an absolute pleasure to adventure with around the world. 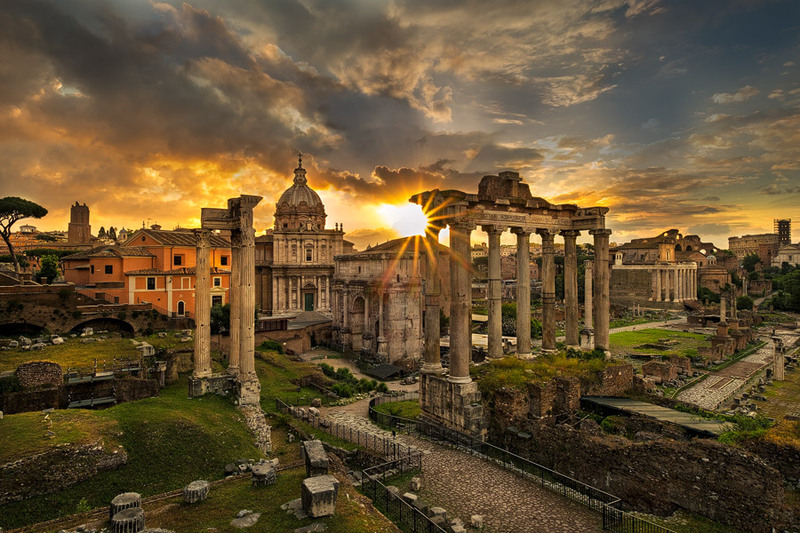 Begin the adventure of a lifetime and jet off to historic Rome. It’s Arrival Day! So step off the plane and look around – you’re in one of this beautiful world’s most historic, iconic cities. After letting that sink in, check into your hotel and join the group as we kick-off our awe-inspiring adventure with a memorable cooking class welcome dinner hosted by our awesome chefs in a stunning setting in the historic center of Rome. On the menu tonight is traditional Italian appetizers, homemade pasta, and of course, plenty of vino. We wrap it up with a dessert that you can't pass up paired with the perfect digestif. This is an evening you'll never forget! Roam the streets of The Eternal City, like Caesar and Augustus once did. Wake up in the city, walk up to Piazza del Campidoglio, and start your day capturing the Roman Forum at sunrise. After this iconic shoot, we'll spend the day steeped in history. With the help of masterful local guides, peruse art you’ve only ever read about in the Vatican Museum – home to one of the world's most prestigious collections – take in the extravagance of St. Peter’s Basilica, pass through the Pantheon, and imagine watching gladiators battle before you while you tour the illustrious Colosseum. End your day taking guided photos of the Vatican and Castel Sant'Angelo, at sunset and dusk, capturing its majesty on the shores of the Tiber River. After all, there are fewer things more beautiful than an Italian sunset. Leave the big city behind, and head for the hills – the Tuscan hills. It’s time to depart this ancient metropolis and travel to the heart of the Italian countryside, Tuscany; but not before capturing a photo of the twinkling Colosseum at blue hour and sunrise. As your driver takes you through the rolling hills, your guides will introduce you to quaint castle towns, like Civita di Bagnoregio: a hidden gem teetering over a vast canyon, where we will feast on hearty Italian cuisine you’ll dream about for days. After a day of exploring, we’ll end with a sunset shoot overlooking the rolling hills of Tuscany. Winding roads, lined with Cypress trees, and only found in Italy. Comb through the cobblestone streets of Tuscany’s undiscovered towns. Wake at dawn and follow us to Val d’Orcia, the backdrop for our sunrise shoot, and the enchanting valley region that’s inspired countless Renaissance painters. After that, we’ll follow Cypress-lined roads, and explore and dine at a rustic organic farm with fresh, locally sourced produce; taking in endless views of Tuscan landscapes along the way. We’ll indulge in elaborate local dishes paired with regional Tuscan wines, and after exploring hillside towns like Monticchiello and Pienza, wrap up our day with a sunset shoot outside of Pienza to capture its golden-hour beauty. Indulge in Chianti and castles in the Italian countryside. We wouldn’t be able to sleep at night if we didn’t take you to the Chianti vineyards. In fact, leaving them out of our day would be a travesty, and we just won't stand for it. So after our sunrise shoot, on our way to Florence, we’ll stop and sip some of the region's best Chiantis on a private group winery tour. Later, we’ll explore Medieval hill towns like famed San Gimignano, and end our day shooting panoramic photos of Italy’s most artistic city, beautiful “Firenze.” Before heading to bed, we’ll gather to celebrate magical Florence with Tuscan steaks, pasta infused with fresh truffles, glasses overflowing with regional wines , and all the Italian wonder in the world. Follow in Michelangelo’s footsteps, and explore the art and architecture of Florence. Sleep in and throw on your most comfortable shoes – today, we’re exploring the artistry and elegance of Florence. We’ll skip the lines and explore Florentine treasures, like Il Duomo di Firenze, along with legendary art museums, like Uffizi and the Galleria dell'Accademia, the latter of which houses the famous David statue. Led by our local guides, educated Master’s of their craft, you’ll be regaled with tales of Renaissance art and history, ensuring your day is filled with intrigue, inspiration and awe. As our day winds down, our cameras will steal a perfect sunset photo from Ponte Vecchio: the famous shop-lined Medieval stone bridge overlooking the Arno River. Before bed, enjoy yet another Tuscan dinner. It’s sure to be a feast for the senses. Head to the colorful seaside villages of Cinque Terre. 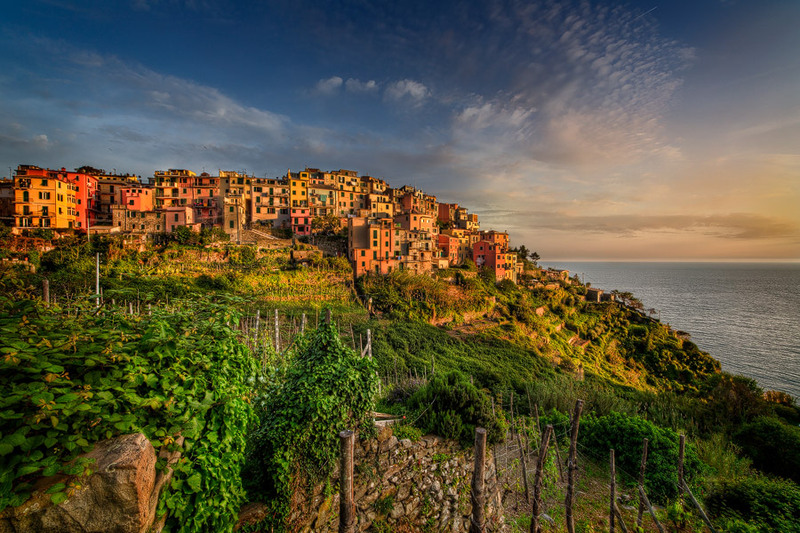 If you’ve seen the colorful, cliffside homes overlooking the Italian Riviera, then you know the five, enchanted seaside villages of Cinque Terre look straight out of a fairytale. But yes, they’re real, and yes, we’re taking you there. After arriving by local train, we’ll taste our way through the “five lands,” being sure to sample the pesto in its area of origin. We’ll eventually land in the charming fishing village of Vernazza, where layers of pastel apartments are home to a mere 600 residents. After we guide you around the natural harbor, through its quaint cobblestone streets and centuries-old churches and castles, we’ll capture the sun setting over the Ligurian Sea. Then it’s time to dine above the waves and enjoy some of the region’s best cuisine: like Tegame alla vernazzana, a layered, casserole-like dish filled with potatoes, tomatoes, local fish, white wine, oil and herbs. Revel in the Italian tradition, and wine and dine on your last day in Italy. Today, we’ll stroll through Cinque Terre, exploring and capturing the beauty and uniqueness of the region. Starting in Vernazza, follow along as we make our way along the coast to Corniglia, Riomaggiore and finally, Manarola. Along the way, you’ll sample local treats, browse through quaint shops and marvel at the magic of these Unesco World Heritage sites. As we experience our final blue hour together, photograph enchanting Manarola, capturing its celestial glow over the Italian Riviera. Afterwards, we’ll celebrate life, laughter, and the memories we’ve made together by basking in a delicious dinner of fresh-caught seafood. Our night ends when the wine runs out – so let’s give one final “salute” to beautiful Italy. We sadly say our goodbyes...until next time. After a seaside sunrise shoot, it’s time for one last scrumptious breakfast before we head to the train station, departing to Rome where it all began. By this point, we’ve traveled this wondrous country together, admiring its beauty and rich history. You will leave our tour with astonishing photos to share with friends and loved ones that most people can only dream of taking. Of course, the real reward will be the stories we create together as we take on this life-changing experience. No camera can capture the magic of these moments, and we know you will cherish them forever. You can’t go to Italy without indulging in some insanely delicious cuisine. Known for its delicate olive oils, robust wines, thin ­crusted pizzas and hearty pasta dishes bursting with flavor, in Italy, food does more than feed you; its part of the culture and nourishes your soul. The food is regional, and the wines are among the finest and most diverse in Europe. Head to the Ligurian region, and you’ll find simpler plates flavored with light basil and pine nuts. At a ristorante in central Italy, it’s all about hearty Tuscan steaks, delectable cured hams and salamis, and cheeses infused with black truffles. The coast is known for its seafood, a direct result of its Mediterranean location, and if you’re a dessert lover, you’re definitely in the right place. For a real treat, follow sweets like Tiramisù, gelato, biscotti, Florentines and cannoli with a sip of grappa. La dolce vita, indeed. As a Special Treat, our guests start off the tour in style as we welcome you to Rome with a dinner you’ll never forget at a gorgeous studio with a rooftop terrace in the historical center of Rome. The special part is that our guests get to enjoy a memorable, fun, and hands-on cooking class under the guidance of our renowned chefs. Great food, excellent wines, welcoming hosts, and new friends… what a way to kick off your Italian odyssey! Oh… we almost forgot to mention our authentic farm to table lunch experience at an organic farm in beautiful Val d’Orcia with one of the most spectacular views you’ll ever experience while dining. Getting hungry?Good! Bring your appetite! Having led photo tours in Europe for years, our photographers and organizers know the best places to stay in beautiful Italy. In Rome, we’ll stay in the heart of the city, near the Pantheon, just steps from sites like Piazza Navona, the Trevi Fountain, the Spanish Steps and some of Rome’s most historic churches. As we venture near the coast, we’ll wake up in one of the quaint, pastel-colored buildings lining Cinque Terre’s coastal cliffs, overlooking the deep blue Ligurian Sea just below. In the Tuscan countryside, our bed and breakfasts will fuse modern luxuries with ancient Tuscan traditions and styles; the perfect base to explore the region’s verdant landscapes and centuries-old buildings, just like its original residents did so many years ago. Over the years, we have established relationships with boutique, rustic and sophisticated hotels in Rome, Florence, Tuscany and beyond, ensuring that where you get a good night’s sleep is as much a part of the experience as all of the astounding sites we see along the way. ND & Polarizer filtersIf you have questions about gear… we can help! Choose your room type below and add to cart to complete your deposit and reserve your spot to join us on this unforgettable tour. I have to tell you all how much I enjoyed the trip to Italy. Really, we were treated like VIP's at every turn. I know all the behind the scenes and all the prep work that went into this event was a tremendous effort and you all made it look absolutely effortless. The tour was amazing–we wanted for nothing. We had someone readily standing by with answers to any question about the area, the foods, the wines...and of course the photography. Thank you for sharing your love and passion for Italy, it came through loud and clear! :) You managed a good sized group with grace and charm and patience and I can't imagine that everyone didn't have exceeded expectations! We are delighted to be partnering with our good friends at Walks of Italy on our history, food, and winery tours. Walks has over a decade of experience organizing day tours all over Italy to rave reviews and their local experts are fountains of knowledge about each region we will be visiting. If you’re looking to expand your Italy adventure to other regions of this spectacular country either before or after the photo tour, we will be happy to help you set up other day tours with Walks of Italy.